In Area 88, the deep desert airbase of the Middle Eastern country of Aslan, mercenary pilots from around the world fly for money under contracts with the government, who pay them for each anti-government element they shoot down or destroy. Since the contracts are for three years, one can only get out of them early by paying off a $1.5 million cancellation fee. It is dangerous work, with a high casualty rate, but the lure of money keeps the pilots in the air. Shin Kazama, an ace among aces, is one such pilot, though he is here unwillingly. He seeks only to earn enough money to get back to his fiancée in Japan as quickly as possible, and is willing to do anything it takes to accomplish that. Visiting Japanese photojournalist Makoto Shinjou, allegedly here on a publicity mission, seems to have taken a particular interest in Shin, perhaps not with the best of intentions in mind. The Area 88 TV series is a remake of a three-episode 1985 OVA series of the same name, which was itself based on an earlier manga series. Familiarity with the manga seems to be assumed, as the first three episodes of the TV series do not in any way explain the backstory of the main characters. Only from reading online sources or Shin's character bio in the Extras section do we know that Shin was somehow tricked into this job, hence the reason for his separation from his fiancée Ryoko. Because of this, reading the Character Bios prior to watching the episodes is strongly recommended. Although the first volume of Area 88 tries to infuse some character development into its action format, this is a series which, at its heart, is all about its high-flying action. Evaluated on that component alone, the first volume succeeds tremendously well. Everything about the aerial combat and maneuvering scenes is exceptionally well-done, especially the incredibly realistic use of sound. All we'd need is Kenny Loggin's “Highway to the Danger Zone” playing in the background and this could almost be the animated version of Top Gun. Unfortunately that's all the series has going for it, story-wise. Shin displays so little personality that most of the supporting characters are more interesting than he is, and Makoto's approach reminds one more of paparazzi than of wartime photojournalists (as mentioned in the Character Bios and interviews, he was a character specifically created for the anime who did not appear in the original manga). The aerial combats, while beautifully staged, have little real tension since the outcomes always seem like foregone conclusions. Let's also not forget the plot holes, such as how the anti-government forces are so well-equipped that they can put dozens of MiGs into the air. Don't look for any female characters, either (at least not in the first volume—there's a female pilot coming in the second one), as the only woman with a speaking role in this volume is a lunch lady. As with other remakes of '70s and early-to-mid '80s series, the artistry of Area 88 offers a curious blend of old and new. Most of the character designs look like something out of the early '80s, with Shin being given a distinctly bishounen look (and gods, that hideous pink hair on his fiancée! ), though they are rendered with up-to-date digital painting and coloring. In fact, the entire production looks like it was digitally-rendered and animated, creating a visual effect which looks sharp most of the time but is also a little too obviously computer-rendered. A good amount of detail has gone into the planes, their weapons, and explosions, no doubt courtesy of numerous consultants listed in the credits. Animation is exceptionally well-handled in the combat and flight scenes, respectable in other scenes. The one major visual flaw is the color scheme, which is much too bright and cheery for the somber content of the series. As mentioned before, the use of sound effects is top-notch, making this one of the best series out there in that regard. Regretfully I cannot say the same about the musical scoring, which mixes piano-based and orchestral numbers with techno themes, the latter of which are sometimes used to “highlight” the fight scenes. The opener is an acoustic orchestrated techno number which might interest fans of techno music but is otherwise unremarkable, while the closer has the flavor of a lounge song. Only the techno parts of the musical scoring are actually bad, but this is not a series which is going to sell itself on its music. ADV's English script has some minor discrepancies here and there but generally stays in the ballpark, with one major exception: it adds in a significant amount of dialogue during the aerial combat scenes where none existed in the Japanese version. Mostly this is stuff like pilots specifying what weapon they're using or saying “splash one” or “splash two” when they take a target down. These additions can probably be attributed to stylistic differences between Japanese and American aerial action movies. Top Gun certainly used dialogue like this during its fight scenes, and a USAF pilot is listed as a Military Consultant for the English dub production, so likely this kind of chatter is authentic. Given the propensity of characters in Japanese fighting series/movies to call out the name of their attack as they strike, it's surprising that the Japanese dub lacks such declarations. Whether a viewer will regard this change as an enhancement or violation of artistic integrity depends on how much of a purist the viewer is, though I favor the former opinion in this case. The English voice-acting is pretty good, while the appropriateness of the casting varies from role to role. Shin has a much deeper voice in Japanese than in English, but Chris Patton has shown in the past that he can capably do the military-minded role and does give Shin a much harder edge than he did for Sousuke in Full Metal Panic!. Kim Aba, the boyish Harrier pilot, is voiced by a woman in both the English and Japanese dubs, and is one place where the English dub is distinctly better. Extras are plentiful on this volume. In addition to company previews and ADV's now-standard “Next Volume” preview, one can find a clean opening and closing, Character Bios, Production Sketches, and Aircraft Specs—although the latter only covers two of the common planes used and has too many “unknowns” in its specs. The feature extra on the DVD is the interview with the Japanese director and screenwriter, a whopping 54 minutes of footage which provides significant insight into the series but also some spoilers, since it was made after the completion of the series. (One of the most interesting points it brings up is that the series is supposedly set “sometime in the '80s” even though one scene clearly shows a laptop computer. Another is that the screenwriter was specifically told by the original creator that the anime was not to be just a direct recreation of the manga, but rather an anime version of the same kind of story.) Included in the liner notes are brief commentaries by the seiyuu for Shin and Makoto. 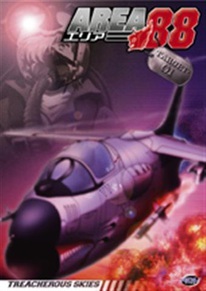 Its superior renditions of modern aerial combat make the first volume of Area 88 a must-see for fans of the movie Top Gun and action junkies in general. Those looking for serious character development or intricate, sensible plotting may be disappointed. Overall it is a respectable remake of the original OVA. + Superb aerial combat scenes and exceptional use of sound, good extras. − Weak characterizations, insufficient background.